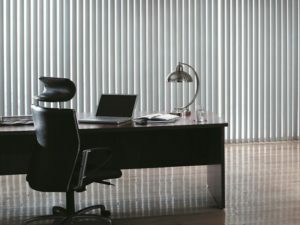 The Decor Connection Window Blinds and Shutters - Office Blinds - What Works? Home/Office Blinds – What Works? We get so many calls from customers needing office blinds. Sometimes the call is for their home office and sometimes for an office building. These customers tend to feel overwhelmed at the daunting burden of excessive costs and of finding the right blind for their space. Studies suggest that natural light in an office creates a more effective work environment, with decreased rates of depression and better quality work. In fact, around the world there is a movement to structure offices in a way that all offices have windows that allow for maximum natural light to enter. In certain instances, the sheerweave roller blind is the best choice. 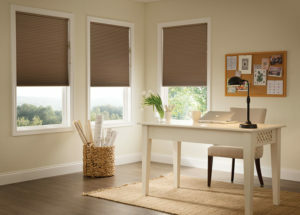 This type of blind has the remarkable property of being able to reduce glare onto the computer screens while allowing in most of the outdoor light. Maintenance is easy and they can stay in the closed position most of the time. This means less fussing over the blinds and more focusing on the work at hand! Sheerweaves are wipeable and durable, as well. 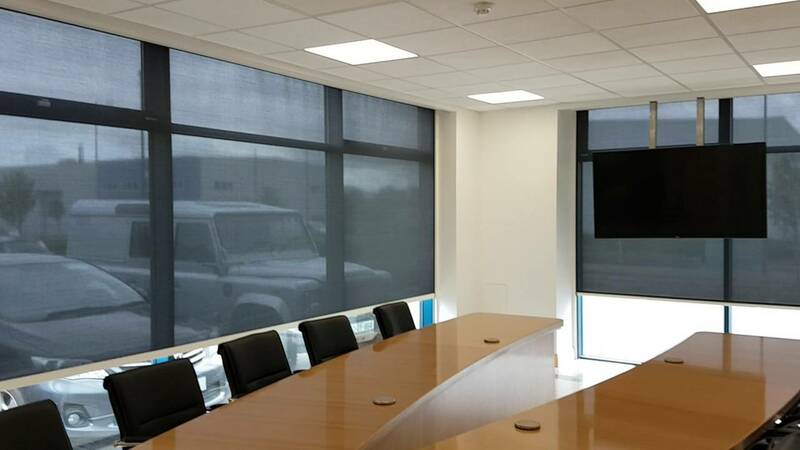 For a boardroom with a projector for presentations, often a blockout roller blind is the best option. This allows for maximum darkening of the room so the presentation can be clearly viewed by all participants. A budget friendly option is our go-to 25mm. Venetian blind. For an office with lots and lots of windows, this is the most economical option. We get a lot of start-ups contacting us for inexpensive options while they get their business off the ground. A 25mm. Aluminium Venetian blind comes in wood-look colors as well, which adds a touch of class to this simple, easy, blind. Another good choice for offices is the understated Vertical Blind. Vertical blinds are inexpensive and come in quite a few color and material choices that will surely blend in with any style. Specifically suited for very large windows, Vertical Blinds come in 127mm and 90mm. Slat widths and allow for light to be directed away from staff when the sun comes beating in. There are PVC options that make these Vertical Blinds easy to maintain because wiping is easy with a damp cloth. Whatever your space, we have the blind for you! We’ve yet to find an office that we couldn’t outfit with the best blinds for the space.